I am planning to pour concrete slab at my backyard. Can you tell me the tools and material i need. 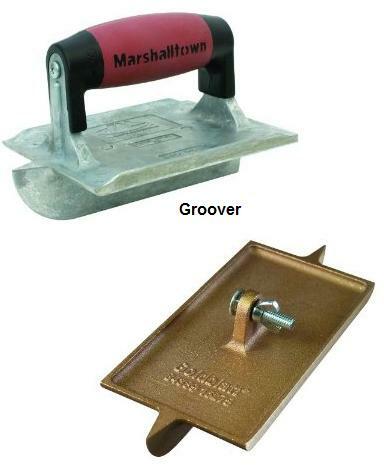 Below are some of the tools needed for any concrete slab, patio or sidewalk. 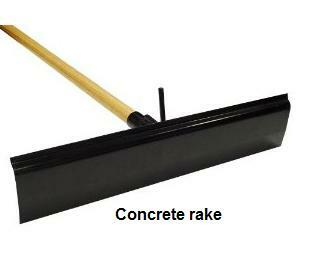 The rake is needed to spread the concrete, a shovel will work fine. The hand float is what needed to level the concrete after you rake it to near level particularly at the edges and tight spaces. 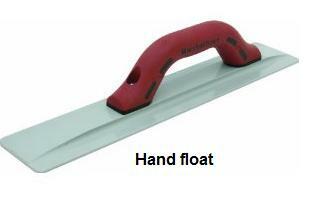 The pull float consolidates and levels the concrete at hard to reach areas. As the pull float moves back and forth, it cuts the highs and move the concrete to the low ares making the surface levels more uniform. The edger makes the concrete edges nice and smooth which is done following pull float. 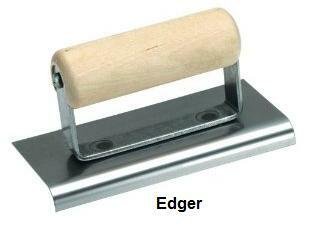 Edger is also used as groover in final finish stage. The groover is for marking the control joints which is approximately 10ft on center for patio, drive ways and 4ft on center for sidewalk. 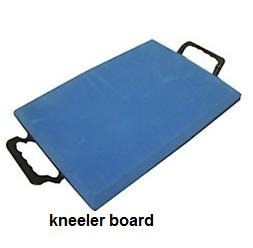 The kneeler board is used when the concrete is hard enough to walk on for final finish. Unless you do concrete in a regular basis, a piece of plywood or waferboard will work fine. 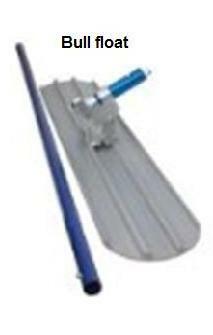 If you want your slab to be broom finish, this concrete broom is the most commonly used. 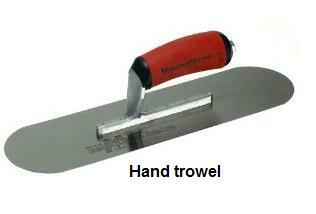 For final finish moving around on the concrete surface, the hand trowel is the tool of choice. These are some of the tools for concrete alone which are not cheap. For forming, you will need a hammer, sledge hammer, level, tape measure, skil-saw or hand saw, wheel barrow, compactor, shovel, and more depending on what type of slab you're pouring.